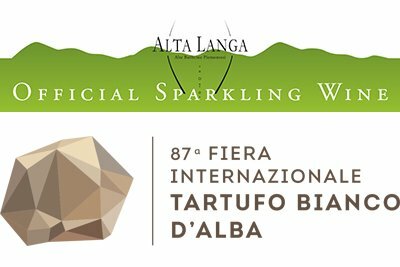 The sparkle of Alta Langa and white truffle: Alta Langa is the official sparkling wine of the alba truffle show for this 87th edition of the event. Lots of different events will be taking place from the 7th of October to the 26th November, offering visitors the chance to explore all the nuances of the pairing between Alta Langa and white truffle, celebrating the strong link between the unison of flavours and tradition, and the excellences of the local Langa produce. Last Tuesday, 26 September, Piedmont’s finest sparkling wine was used for the opening toast at De Truffle. Alessi Design meets the Alba White Truffle and during the lunch that followed at Guido Ristorante Villa Reale Tenuta di Fontanafredda (chef Ugo Alciati). And it will be served again on the 3rd of October, for the toast at the press conference to present the event at the Foreign Press Association in Rome. Alta Langa will be present at the official opening of the show on Friday the 6th of October, at the Teatro Sociale Busca di Alba, and at the Gala Dinner held at the Fondazione Ferrero. During the Show, a space will be dedicated to tasting Alta Langa in the Grande Enoteca and an Alta Langa corner will be set up in the Sala Beppe Fenoglio, Cortile della Maddalena. From cooking demonstrations by acclaimed chefs (Pasquale Laera, Luca Zecchin, Andrea Berton, Andrea Larossa, Michelangelo Mammoliti, Eugenio Boer, Cristina Bowerman, Stefano Paganini, Federico Gallo, Marco Giacosa, Marco Stabile, Ugo Alciati, Giampiero Vento, Luigi Taglienti, Mariuccia Roggero, Damiano Nigro, Davide Palluda, Christian Milone, Flavio Costa, Massimiliano Musso, Walter Ferretto, Francesco Oberto, Andrea Ribaldone, Davide Oldani, Massimo Camia, Marc Lanteri and Andrea Larossa) to meetings with guests, all the appointments of the Alba Truffle Show will be accompanied by Alta Langa. And there will be an Alta Langa Lounge in the Salotto dei Gusti e dei Profumi (piazza Risorgimento). ALTA LANGA CONSORTIUM – Alta Langa Docg is the high quality dry sparkling wine from Piedmont. Born in a beautiful winegrowing area in the high hills between the provinces of Cuneo, Alessandria and Asti, it has a very long history: it was the first metodo classico sparkling wine to be made in Italy, way back in the mid-18th century. The Alta Langa Consortium is a small organisation which runs very smoothly. It currently has 85 members, all of whom are active and involved in the development of a wine, an appellation and a terroir. All united by a single aim: to create a wine which takes six years to be ready for sale, meaning that it absolutely has to be an important wine. Enamoured of our land, we have launched a sustainable viticulture in harmony with the delicate, biodiverse structure of the Alta Langa and its ideals, respecting and enhancing the rhythms of nature. Piedmont’s finest sparkling wine is the fruit of this philosophy and this work. Available in white, rosé, brut and pas dosé versions, it spends a long time ageing on yeasts, as stipulated in the very strict regulations governing its production. This long wait demands patience and, in this case too, all the Alta Langa producers second the rhythms of the traditional farming calendar. Members of the Consortium include sparkling wine producers Avezza, Banfi, Bera, Brandini, Bretta Rossa, Paolo Berruti, Giulio Cocchi, Enrico Serafino, Fontanafredda, Gancia, Germano Ettore, Martini & Rossi, Monteoliveto, Pianbello, Tosti, Colombo Cascina Pastori, Roberto Garbarino and Giribaldi. Alta Langa’s partners are Eurostampa and Verallia.